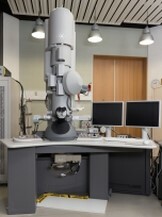 Description: Suitable for high-end TEM / STEM work on a very wide range of materials science problems ranging from nano-materials, metal alloys, polymers to ceramics and minerals.The Super Twin pole-piece offers high resolution imaging in both TEM (2.4 Å) and STEM (~2 Å) modes whilst remaining easy to use and stable in operation.The Bruker X-Flash X-ray detector has an energy resolution of 123 eV (Mn K). In STEM mode, point, line-scan and area (mapped) X-ray analyses can be obtained at spatial resolution close to 1 nm. The windowless detector offers very high sensitivity for the light elements (B, C, N, O): up to three or more times greater than an equivalent ultra-thin window detector. Technical Configuration: 200kV; FEG-TEM/STEM; Super-Twin lens; 5-axis compustage; column isolation valves for rapid sample exchange; Fischione Instruments 3000 annular dark field detector; on-axis BF/DF detector; dry pumping system; Orius SCD200D wide-angle CCD camera (diffraction capable); Ultrascan 1000 high-resolution CCD camera; Bruker 30mm2 123 eV windowless SDD and Quantax analysis system; single tilting and beryllium (low background) double-tilting analytical sample holders; plate film or imaging plate capability; tomography and low dose acquisition software.